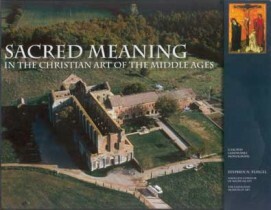 In Sacred Land, author Mark Buechsel shows that Sherwood Anderson, Willa Cather, and F. Scott Fitzgerald, among others, turned to two potential sources for grounding their region’s and nation’s life authentically: nature itself—particularly the super-abundant nature to be found in Midwestern states and the model provided by the traditional sacramental culture of medieval Europe. The result was a new sacramental vision of how life in the Midwest—and, by extension, life in modern America—might be lived differently. Buechsel demonstrates that each author painted his or her spiritual and cultural vision with different shades and nuances and looked to America’s future with varying degrees of optimism. With absorbing prose and detailed images, Stephen Fliegel unlocks the secrets of these sacred objects and portrays medieval Christian believers as souls kindred to us—humans striving in their own time to discern and preserve religious meaning and decorum. Fliegel provides a rich, understanding of the allegorical images that helped the church to communicate to the faithful through visual narrative and also provides a rich, textured understanding of sacred art and architecture. In the first decade after World War II, Singapore underwent radical political and socioeconomic changes with the progressive retreat of Great Britain from its Southeast Asian colonial empire. The United States, under the Eisenhower administration, sought to fill the vacuum left by the British retreat and launched into a campaign to shape the emerging Singapore nation-state in accordance with its Cold War policies. Based on a wide array of Chinese- and English-language archival sources from Great Britain, the Netherlands, Singapore, and the United States, Safe for Decolonization examines in depth the initiatives—both covert and public—undertaken by the United States in late-colonial Singapore. Peter S. Bridges’s service as an American ambassador to Somalia capped his three decades as a career officer in the American Foreign Service. Safirka, a frank description of his experiences in Somalia and elsewhere, offers pointed assessments of American foreign policy and policymakers. Bridges recounts his service in Panama during a time of turmoil over the Canal; in Moscow during the Cuban missile crisis; in Prague for bleak years after the Soviet invasion; in Rome when Italian terrorists first began to target Americans; and in key positions in three Washington agencies. In The Sage of Tawawa, Annetta L. Gomez-Jefferson offers Ransom as a symbol of an era and a larger movement and recalls him to be a man of deep faith and conviction. Educated at Wilberforce University in Ohio (after losing his scholarship from Oberlin College for protesting the segregation of the campus dining halls), Reverdy Cassius Ransom worked with and for the African Methodist Episcopal Church. His duties saw him run for Congress, be elected bishop of the African Methodist Episcopal Church, serve as editor of the A.M.E. Church Review, and serve as church historiographer. In July 1941, Ransom received a letter from President Roosevelt appointing him to the Volunteer Participation Committee in the Office of Civilian Defense. Wilson offers a rare uncensored picture of enlisted life, with descriptions of bar girls and waterfront establishments that catered to the needs of American bluejackets, as well as observations on world events during imperialism. Wilson also discusses one of the great yet largely ignored issues of the turn-of-the-century U.S. Navy—the failure of naval officers to provide the quality leadership necessary to ensure the operation of efficient, effective warships. A Sailor’s Log is a detailed and insightful account of life in the Asiatic Fleet that enriches our understanding of U.S. Navy life a century ago.